From August 30 to 31, 2016, the European Stadium & Safety Managers Association (ESSMA), which now also incorporates Head Grounds Managers, will bring together pitch experts from all over the world to gather in Paris, France, for two-days of intensive knowledge exchange. This year’s Workshop will focus on specific pitch management topics, including extreme weather conditions, multifunctional pitch management, the right machinery and training centre development. Stadia & Arena Asia Pacific 2016 will bring together the movers and shakers from the world of sports venue design/build, management, operation, fit-out and technology at the Yokohama Arena, Japan this September (28-30), for three days of networking, knowledge-sharing and doing business. ALAD Ltd (the show organisers) are delighted to announce that Major Events International (MEI) has renewed its status as an event partner for 2016, with much closer cooperation between the two. MEI members will benefit from participating in an MEI trade mission to include panel speaking opportunities, discounted exhibition stands and sponsorship rates, as well as specially reduced delegate pass rates and roundtable meetings with key organising committee stakeholders. We are excited to strengthen our partnership with Stadia & Arena Asia Pacific this year. This expo allows us access to the Japanese market for our members and clients; a growing market full of sporting opportunities with the Rugby World Cup 2019 and Summer Olympics 2020 taking place in Japan. Major Events International is the only global professional membership scheme across all sectors in the major events industry. The organisation has years of experience working with ‘best of breed’ companies for the world’s most iconic sport events, including World Cup series, Olympics and regional games. With direct links to organising committees, specialist sector groups, and targeted networking opportunities, MEI’s promise is to make companies succeed in the global major events marketplace. With a conference featuring over 50 industry experts and a free-to-attend exhibition showcasing the leading product and service providers in the sector, Stadia & Arena Asia Pacific is already established as the largest gathering of industry professionals in the entire APAC region. Stadia & Arena Asia Pacific 2016 welcomed nearly 400 attendees from around 40 countries, from stadium managers to event organisers, who spent three days networking, doing business, learning and knowledge-sharing. PanStadia & Arena Management is proud to be an Official Media Partner for the Stadia & Arena Asia Pacific 2016 event, as well as to the MEI and its members. The 2016 Asia Pacific Venue Industry Congress theme is: ‘Innovate – Integrate – Motivate”, and will be held at the Brisbane Convention & Exhibition Centre (BCEC), Australia, from 15 to 18 May 2016. Highlights of this year’s Congress include presentations on Live Music, Arts & Cultural Festivals; Safety and Security within Mass Gathering Environments; Data Analytics; Viable Regional Venues; Venue Architecture and Interior Design; Human Resources and Litigation; Venue Design and Technology; Live Music Promoters and Ticketing; Brisbane’s World Class Venues; Rise of South-East Asian Venues; Food & Beverage Planning and Delivery; Event Sponsorship Trends and Opportunities; Environmental Programs for Venues; Crisis Media Management; Major Events Across Diverse Sectors; and much, much more! Following a record-breaking 2015 Congress, this year’s Congress will share new and exciting ways to innovate, integrate and motivate in today’s modern and contemporary venues. The 2016 Congress will challenge traditional thinking around how venue professionals innovate, integrate and motivate within a modern venue environment. It’s been over 20 years since we’ve been to Brisbane, and we’re very excited that this year’s destination will play an important role in bringing together the largest gathering of venue professionals in our region. Karen Totaro, CFE, and IAVM make a great team. Her career in venue management has been successful, extensive, and diverse, and IAVM has been there for her every step of the way. A member since 1999, Totaro is now channeling the enthusiasm and industry knowledge from her years of involvement to lead the association as its 2015-2016 Chair. Totaro, who is currently the General Manager of the Atlantic City Convention Center in Atlantic City, New Jersey, credits IAVM with directly influencing her career from when she graduated college in the early 1990s up through today. She said it was a helpful resource for her at a time when the industry was starting to grow and full-time venue staff positions were rare. I knew I just needed a foot in the door, and then my drive and passion for the industry would help me do the rest. I attended my first regional meeting for IAVM and came back to work so excited to implement things I had learned. Then, I was given the chance to go to Venue Management School and came back on fire to learn more. Her burn for knowledge, the industry mentors that she lovingly calls her “Yodas” and the association’s support resulted in a career that has spanned both coasts and venues of all sizes, not to mention IAVM leadership roles that include Region IV Director, Chair of the Education Council and seats on the Board of Directors and Board of Governors. She said a pivotal point was when she received an exciting phone call informing her that she was the association’s second vice-chair. “I remember, to this day, that I was standing in my loft in Cincinnati, and I actually twirled because I was so thrilled! All of these roles, my multiple industry jobs, the obtaining of my CFE, and the industry educational programs I have attended and continue to attend over the years all played a significant role in me taking the gavel in Baltimore,” she said. Totaro was attracted to a career in venue management because of the “adrenaline and energy” that comes with producing a successful event. Her first job in the industry was working at the Assembly Hall Arena at the University of Illinois. Her sister, Kathryn, who was two years ahead of her at the university, had a job working concessions there. The rest, as they say, is history. Her days, like those of most venue managers, are busy and diverse, so she relies on an updated Microsoft Outlook calendar, a tidy desk, and a to-do list to keep everything running smoothly. However, she said that an engaged staff and flexibility are her real secret weapons. Mentorship is a top priority for Totaro. She said that it’s immensely rewarding for the parties involved and can be organized at all levels of commitment. They have so much potential. I am excited to see where they go in their careers! Volunteer for everything, be it extra work at the venue you work at our helping out at an IAVM meeting you are attending. Find out who is coordinating events and offer up your services. You would be surprised how easy it is and how many people you meet by volunteering. At work you want to be seen as the ‘can do’ person – no whining, no sarcasm – just ready and able to jump in and help the team. You might not think your bosses notice or care, but I promise you they do. The program that set me ablaze was the Public Facility Venue Management School [now named Venue Management School], which is held for one week in June over two consecutive years. This is where you will clearly determine if this is the career for you or not. There are so many scholarships available, so there is no excuse to not at least try to go. My boss at the time let me attend since it was paid for by my regional scholarship. I just had to write a one-page essay on why I wanted to go. Branding does not simply mean a logo change, but a deep dive in understanding what IAVM is to our members and what they see it being to them in the future. Additionally, IAVM excels at education and networking opportunities. Our members say this is what they deem most significant and what they find most rewarding. The Allied members are seeing the value and recognizing the reward in IAVM participation. I have grown up in this industry with just as many close friends that are Allied members as Professional members, so I truly understand that while the needs may, at times, be different they are all equally important. We have VenueConnect, sector meetings, regional meetings, schools, and much more. Most associations our size produce just a handful of major events per year. They can capture the biggest audience and focus the dollars efficiently while meeting the members’ needs. Because Totaro knows IAVM, and due to her deep history the association’s members know her, she is in an excellent position to determine the answers to some critical questions and position it for success. Totaro is optimistic about her term leading a “fantastic” board, but plans to apply her personal philosophy to the role even if things become challenging. PanStadia & Arena Management magazine is proud to be an Official Media Partner to IAVM and its members. One of the principal goals of ESSMA (the European Stadium & Safety Managers Association) is knowledge-sharing within the stadium industry. That’s why they were very proud to welcome more than 30 of their members, representing more than 9 countries, on their 2014 Pitch Tour of London. After a successful visit to the Estadio do Dragao in Portugal back in 2013, ESSMA opted to pay a visit to some of their UK member grounds in London; renowned for their expertise in pitch management. The tour kicked off at Emirates Stadium, where Mr. Reece Watson spoke to the delegation on the best-practices and technologies employed, while in the afternoon the delegation visited Mr. Steve Braddock at the famous Arsenal training grounds. Day 2 started with a visit to Craven Cottage – home to Fulham FC -­ where Mr. Greg Bolton and Mr. Rory Ferguson welcomed the attendees. And the tour ended with a visit to England’s National Stadium, Wembley, where Mr. Tony Stones presented to the delegation. discussions arose and knowledge was shared, as were contact details, which proves that the goal of the event was achieved and positive feedback was given. Next up is the ESSMA Summit, taking place January 27-28 at Allianz Arena in Germany, which will provide another great opportunity for members to network, knowledge-share and learn from industry-leading experts. PanStadia & Arena Management is the proud Official Media Partner to ESSMA and its members, and Editor, Katie McIntyre, will be in attendance at next month’s Summit. The IAVM Foundation has been committed to programs, ideas and initiatives that build amazing careers and a strong future for the industry for more than 32 years; over which time it has bestowed more than 300 scholarships worth approximately US$350,000. Back in July, at IAVM’s VenueConnect in Portland, the Foundation continued this legacy by announcing its newest campaign, ‘Build An Amazing Future‘. This campaign is a three-prong approach focused on students, young professionals and mid-level management in the venue management industry. Part of this approach is the commitment to funding just over US$40,000 to provide 37 scholarships + internships through the Joseph A. Floreano Scholarship + Internship Program for venue professionals, young professionals and students to attend IAVM sector meetings, schools and VenueConnect each year. The funds will help cover the registration fees and all hotel accommodations. The Performing Arts Managers Conference in San Francisco, February 15-17, 2015, will be the first sector meeting that scholarships will be offered. Visit www.iavm.org/amazingfuture for eligibility and to apply. The Joseph A. Floreano Scholarship + Internship Program recognises deserving individuals who demonstrate leadership, character, diversity, community involvement and the potential to be future leaders in the venue management industry. 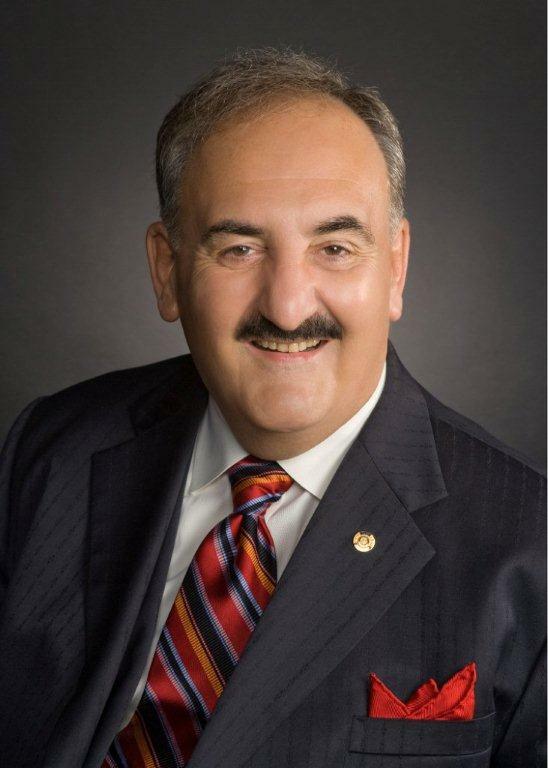 The program was established after the passing of Joseph A. Floreano, CFE, (pictured) a long-time IAVM member, Foundation Trustee and the first-and-only Honorary Chairman of the Foundation Board of Trustees. Floreano was known for giving selflessly in both time and money to worthy industry causes. His leadership was aspirational and he took great pride in mentoring and supporting the advancement of the venue management industry. Joe Floreano was not only incredibly instrumental in the development of the Foundation’s Build An Amazing Future campaign but also became the inspiration as he truly resembled and embodied everything it stands for. The contributions Floreano made to the Foundation are immeasurable, and with that, we believed that the naming of the scholarship program would be the most appropriate way to honor his legacy, which will forever leave a mark on the Foundation. This scholarship and internship program memorializes the life and contributions a man who spent a lifetime leading by example. Joe was on a constant quest for quality and daily illustrated his love of servicing others. It was his attention to detail and warm-giving personality that earned him the respect and honour of his community and his peers. The professionalism by which he served the public, the IAVM association, belief in continuing education, and willingness to give to others to improve the future of our industry can only be regarded as legendary. I know he, his family, and staff will be honoured to know that future generations to come will continue to learn by the outstanding example and legacy he has left behind. I can’t think of a greater gift that the association and Foundation could give to future generations than a scholarship or internship named after a master of the craft of public assembly facility management. The Joseph A. Floreano Scholarship + Internship program will select five outstanding candidates to receive scholarships at the Performing Arts Managers Conference (PAMC), the Arena Management Conference (AMC), and the International Convention Center Conference (ICCC) in 2015 based upon the following five categories – Outstanding Leader, Diversity, Industry Women, Young Professional and a Student Internship. The program also has scholarship + internship opportunities at the Academy for Venue Safety & Security (AVSS), Venue Management School (VMS) and the Association’s annual conference, VenueConnect. The IAVM Foundation is committed to fostering and supporting the next generation of the venue management industry. By naming the program after Joe Floreano, we are setting the gold standard of what we should all strive to aspire to be. Joe was the ultimate mentor, leader and friend to all. In addition to the Joseph A. Floreano Scholarship + Internship Program, the Build An Amazing Future campaign will also be launching a 30 UNDER 30 Program for young professionals and a new certification – Certified Venue Professional (CVP). To learn more about the campaign, please visit: www.iavm.org/amazingfuture. PanStadia & Arena Management is proud to be a longstanding media partner to the IAVM and its members. At the recent annual general meeting, members of Sports Turf Association Inc. (Sports Turf Association) voted to continue the provincial not-for-profit corporation into the federal jurisdiction. The result? Updated letters patent, revised and updated governing by-laws, and the introduction of a now Canada-wide organization. As part of this renewal process the Sports Turf Association intends to become known as Sports Turf Canada, registering it as a trade style name. The Sports Turf Association launched a branding and marketing review in 2013 examining its core values, positioning statements and brand through discovery meetings and phone and email interviews with members, stakeholders, the board of directors and staff. During this process the necessity for a more fitting corporation status, together with a title more reflective of its membership was confirmed. First identified as a goal at the inaugural meeting of the Association, the emergence of a more national profile was strengthened in 2009 with the recognition of the Sports Turf Association as the Canadian International Affiliate Organization of the American Sports Turf Managers Association. It continued to develop its Canadian presence with initiatives in Atlantic Canada beginning in 2011, and in 2012 with the formalization of a partnership agreement with the Western Canada Turfgrass Association (WCTA), which recognized the Sports Turf Association as the national body for the promotion of better, safer sports turf in Canada. “The creation of a national association was the vision all those years ago. It is exciting and gratifying to watch this niche organization grow into one with a national presence and a national mandate,” enthused Michael Bladon, a founding father of the Sports Turf Association.